During the French and Indian War, the Lenni-Lenape (or Delaware) Indians of New Jersey were among the tribes that signed the Treaty of Easton of 1758. The tribes agreed not to support the French in the colonial conflict and to leave their eastern lands in exchange for a British promise to stop incursions into Indian territory west of the Alleghenies. While many Lenapes chose to leave New Jersey, a few who had converted to Christianity stayed. New Jersey set aside its first Indian reservation, known as "Brotherton," near present-day Indian Mills in Burlington County. Led by the Reverend John Brainerd, a missionary, approximately 200 Native Americans settled at Brotherton and established a community around grist- and sawmills. We are exceeding glad when we see we are like to live in Quietness among one another without giving any offence to one another, & this of keeping white people from or among us will be a great step towards it, & for this reason we intend to stand by or rather stand Hand in hand against any coming on the Indian Lands without we all agree as one to let him come. Conditions at the reservation continued to deteriorate and in 1796, the Oneidas in New Stockbridge, New York, invited the remaining members of the Brotherton community to join them. 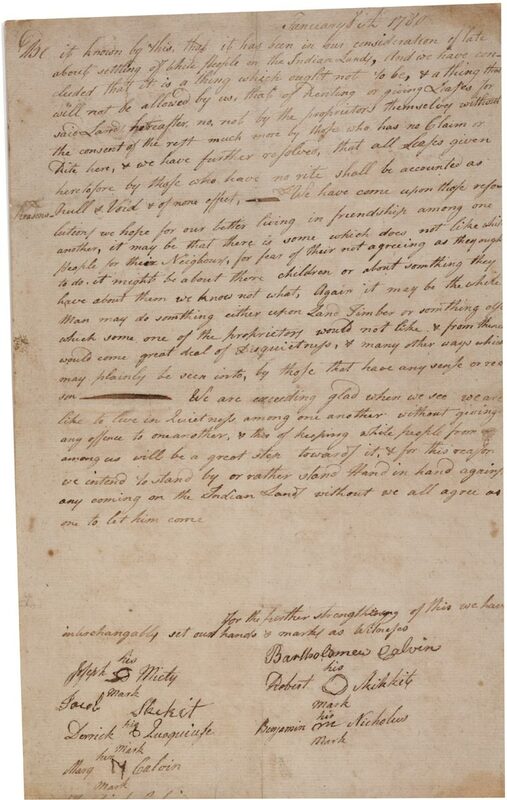 They decided to stay in New Jersey, and in 1798 signed a "publick expression" affirming that decision (see the Brotherton statement of refusal to leave New Jersey, January 20, 1798 [GLC00540.02]). Three years later, however, they changed their minds, and the New Jersey Assembly agreed to sell the reservation and give the profits to the remaining tribal members. In 1802, most of the men and women from Brotherton left New Jersey to join the Oneidas, while a few stayed behind and were integrated into the white community. Be it known by this, that it has been in our consideration of late about settling of White People on the Indian Lands, And we have concluded that it is a thing which ought not to be, & a thing that will not be allowed by us, that of Renting or giving Leases for said Lands, hereafter, no, not by the proprietors themselves without the consent of the rest much more by those who has no Claim or Rite here . . . We have come upon those resolutions we hope for our better living in friendship among one another, it may be that there is some which does not like white people for their Neighbours, for fear of their not agreeing as they ought to do. it might be about there children or about something they have about them we know not what, Again it may be the white Man may do something either upon Land Timber or something else which some one of the proprietors would not like & from thence would come great deal of Disquietness. A complete transcript is available here. Describe the events that led to the Lenni-Lenape Indians living on the Brotherton reservation in New Jersey. Why did the settlement at Brotherton fail? Cite evidence from both the introduction and the document to support your answer. 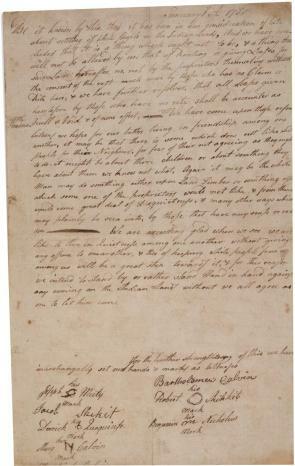 Study the Brotherton statement of January 6, 1780. What was the Lenape reaction to non-tribe members owning or living on Brotherton land? Why did most members of the Brotherton community leave New Jersey in 1802? Where and among whom did they resettle?